Named after the delicate, tropical flower, our chic restaurant, Frangipani, offers a unique fine dining experience in Mumbai. Welcome to a 'theatre of food', where preparation and presentation play a leading role. 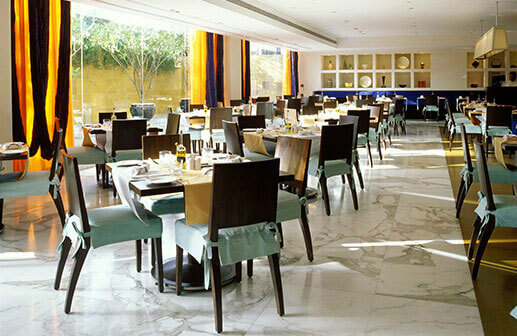 Brightly lit and decorated in lively hues with an understated elegance, the main restaurant at Trident, Nariman Point serves authentic Italian, Mediterranean and Indian delicacies. Feast on a Frangipani speciality grill, a healthy mezze platter, a Goan shrimp or Bengali fish curry, a homemade pasta or hand tossed pizza and enjoy the lively buzz of conversation and exciting gourmet shows taking place in our live kitchens at Frangipani restaurant. Frangipani is open for all day dining. All Day Dining - 7 a.m. - 12.30 a.m.
Buffet Lunch - 12:30 p.m. - 3 p.m.
Buffet Dinner - 7:30 p.m. - 11 p.m. Try our pan-seared chicken escallops' Chicken scallopini, with lemon zest and sage along with a fine herb gremolata drizzle. It's the kind of comfort food for any time of the day. The king of fruits is back! Enjoy mango based beverages, delicious desserts like our Philadelphia mango cheese cake or a bowl full of the freshest picks of the season. Make Sundays more sparkling with our lavish Sunday Brunch, with an array of dishes, unlimited pours of fine wines, beers and other spirits.